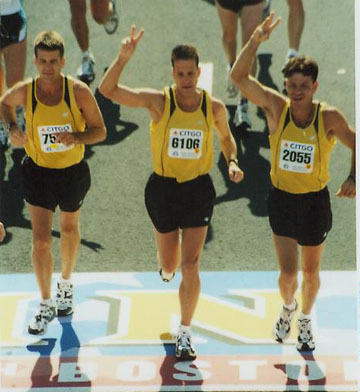 *Gidus Brothers’ Note: Prior to running the Boston Marathon, the Gidus Brothers carried out research that led them to believe three brothers had never qualified for and completed the Boston Marathon together. 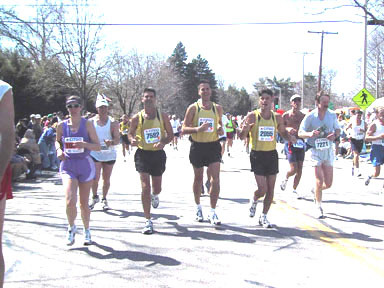 However, in a letter to the editor of the Orlando Sentinel published several weeks after the marathon, it was pointed out that four brothers, one of whom resides in Central Florida, completed the Boston Marathon in 2000. The brothers grew up in Ashtabula, Ohio and relocated to Central Florida as young adults. History will be made on Monday at the 107th running of the Boston Marathon, a first-ever with an Ashtabula connection. 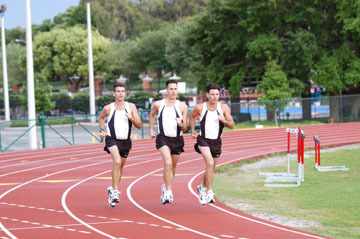 Never in the race's long history have three brothers qualified and run together at Boston. Never, that is, until this year, when Paul, Stephen and Jim Gidus will go north to become the first fraternal trio to compete in the Boston Marathon. The Gidus brothers have lived in central Florida since the mid '80's, but they spent much of their youth in Ashtabula. Paul is a 1978 Ashtabula graduate, Stephen a 1980 graduate and Jim a 1981 graduate. All three ran cross country for the Panthers and went on to run at Kent State-Ashtabula. "The years we were in Ashtabula were the very formative years of our lives," Stephen said in a telephone interview from his home in the Orlando area. "Those were the years when I was in grade school, junior high and high school." There are some really great memories of those years. I was in Ashtabula for about 10 years, but it was a big part of my life." After high school and college, the sons of Marie and Tim Gidus continued running. For Paul and Stephen it was more recreational running, and they ran in a 5K here and a 10K there. But Jim did run in the 1984 Cleveland Revco Marathon, finishing in 2:46, and in 1989 he completed a sprint marathon in 56 minutes. "When I got done, I felt I had completed something very special," Jim said of the Revco. "I thought it had to be the most exciting, excruciating event in sports." 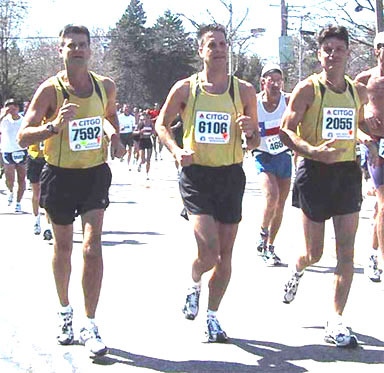 The Gidus brothers' quest for Boston actually began in 2001, when Stephen ran in his first marathon. "I watched Jim when he ran in the Disney Marathon," Paul said. "And I thought it was something I'd like to do." But there were other reasons why Paul started running again on a more regular schedule. "I had started to put on a little weight," Paul said. "I was about 20 pounds overweight, and I started to run more to stay in shape. I got started and set some goals and got more and more into it." It was Stephen, however, who first saw the possibility of the brothers running together at Boston. He was also the one who researched the matter and discovered three brothers had never run together in the nation's oldest marathon. Paul was excited by the idea. Jim wasn't. "My brothers kept trying to get me to go in with them," Jim said. "They said we could set a world's record. But I knew the commitment it would take. You have to train two hours a day, watch your diet, and there are other variables to consider." But his brothers were not easily dissuaded. "Finally, they got me to say 'yes.' My brother Stephen usually gets what he wants," Jim said. Stephen also did a lot of leg work involved in getting New Balance Athletic Shoe, Inc. to sponsor the brothers. 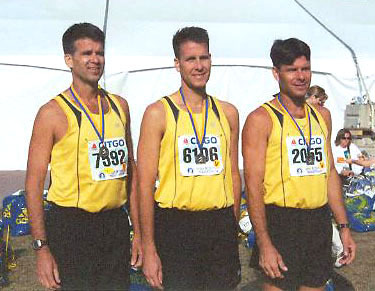 The next step was for each of the Gidus brothers to qualify for Boston. "The big thing is staying healthy," Jim said. "I'm sure this could have been done before, but it's hard to avoid injury." 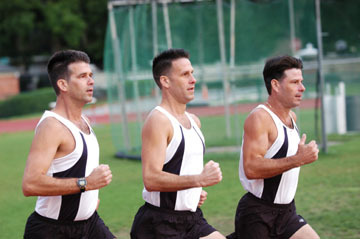 Paul and Stephen each needed a time of 3:20 or less in order to qualify, and Jim a 3:15. In April 2002, running in his first marathon, Paul came up short in Cleveland, finishing in 3:32. 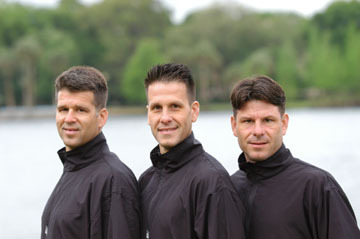 The three brothers all ran in the Columbus Marathon in October. Stephen clocked a 3:13, his personal best, to qualify, and Jim qualified easily with a time of 2:56. Hampered by a hamstring injury, Paul ran a 3:33 in Columbus. But undeterred, Paul tried again and succeeded in January, clocking a 3:18 in the Houston Marathon. The Gidus brothers make their livings in construction. Paul and Stephen own PSG Construction, which specializes in residential remodeling and renovation. Jim owns Extreme Care, a demolition maintenance company. "My father worked construction," Jim said. "He hurt his back, but he didn't go after disability or anything. He ended up driving a truck for Post Lumber. He taught us so much. He remodeled our whole house. He did every room in the house, and we learned so much from him. He's been a big influence." Paul and his wife, Tammy, have three children: Natalie 10, Lydia 7 and Luke 3. Jim and Carol Gidus have a son, Christian, 6, and a daughter, Jessica, 4. Stephen is a bachelor, which could cause its own problems at Boston. "The course goes by Wellesley College, a women's school," Stephen said. "Every year, all the girls line up along the road to cheer the runners on. I guess that could be a distraction for me."